I’ve mentioned before that this first week after the time change isn’t my most favorite one of the year. Maybe you feel it, too? The body’s confusion about why all of a sudden we have to get up even earlier than usual. Even my dog isn’t ready to get up first thing, but she has enjoyed getting dinner earlier than usual. The weather is gorgeous, though, and Spring is definitely here, making it practically impossible to sit inside for long lengths of time. And the light lasting longer in the evening means I can sit outside and read. Here’s a list of some of my favorite reads from the last few months that might inspire you to grab a cold Izze and head outside to read. 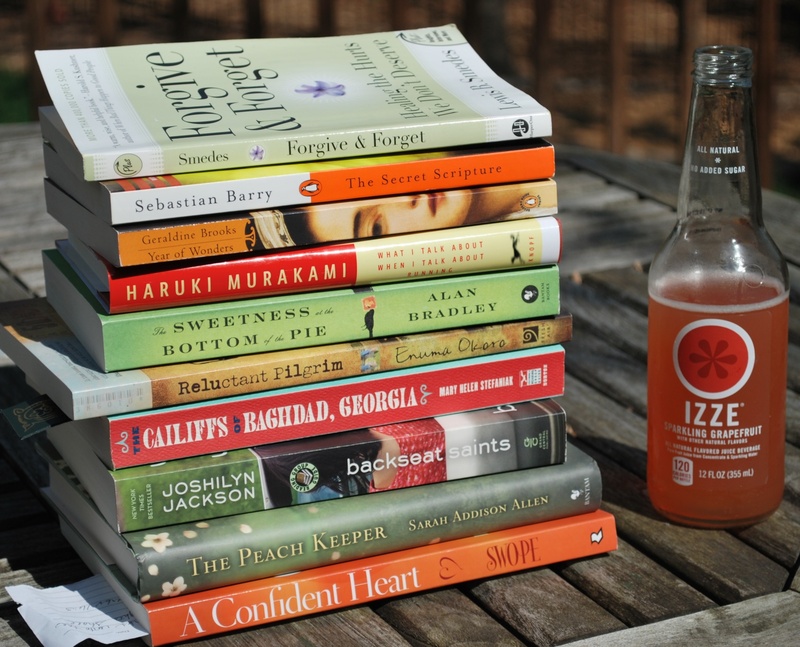 A few of the books I've been reading, along with my favorite soft drink: grapefruit Izze! A Confident Heart by Renee Swope. Two friends and I have been getting together since January to read through this book and learn more about God’s love and unique plan for each of us. Swope is leading an online study of the book now through her blog and will start a new online study of it again in April. If you need a confidence boost that’s based in Biblical truth, I highly recommend this book. Well, that should go without saying. I wouldn’t put a book on this list if I didn’t recommend it. The Peach Keeper by Sarah Addison Allen. Allen is one of my favorite new Southern writers. You’ll notice that her book is one of just a few hardbacks in the collection. I do not have the will power to wait for paperback versions of her books. Her magical fiction delights and nourishes my imagination, and her characters (well, the nice ones anyway) are ones you’ll wish lived next door. Backseat Saints by Joshilyn Jackson. My husband and I both love this Southern writer’s books. He usually finds them and reads them first. Jackson has a new book out in hardback, and I’m not sure I’ll be able to wait to get it in paperback. Her characters are amazing and gritty and capital-D Dysfunctional but in a lovable, larger-than-life way. Unlike Allen’s nice, sweet characters, you wouldn’t necessarily want Jackson’s characters living next door to you, but you would definitely want them on your side in a fight – like Rose Mae Lolly (now Rose Grandee) who has to decide what measures she’ll take to get out of an abusive marriage. In addition to her books, Jackson has a fun, honest blog, too, that you should check out. 3/16 update: Chris’ comment below about this book is dead right. I neglected to mention that you should read Jackson’s gods in Alabama at the very least (and maybe some of her other novels, too) before you dive into this one. The Cailiffs of Baghdad, Georgia by Mary Helen Stefaniak. I’m only 47 pages into this charming book reminiscent of To Kill a Mockingbird. The narrator is a school girl in Depression-era, small-town Georgia. I had to hold off reading this because Rose Mae Lolly (see above) kept threatening to turn up in this book – at least in my mind – and so I switched to non-fiction to cleanse my palate and came back to this one. Right now, the idealistic, young school teacher is taking a great risk by teaching two young African Americans (along with their teacher) in the early hours before the school day starts. Reluctant Pilgrim, by Enuma Okoro. A fabulous, honest, funny, sad, tell-it-like-it-is memoir about an introvert who takes you along as she searches for a Christian faith community where she fits. If you’ve ever felt like you don’t quite fit in at church or aren’t even sure you should even bother trying, this book will feel at home in your hands. Did I mention that you’ll laugh out loud and cry out loud, too? And if you ever get to meet Enuma, watch out: she shared her life story with you in this book and will have you spilling yours to her before you even know it (I ♥ you, Enuma!). The Sweetness at the Bottom of the Pie, by Alan Bradley. I’ve been slowly coming back to a genre I first loved in middle school: who-done-its. This one features sassy 11-year-old Flavia de Luce, who gets thrust into solving a murder that happens in her very own garden when the police are content to nab the first likely suspect: Flavia’s father. What I Talk About When I Talk About Running, by Haruki Murakami. A wonderful, spare look at running and writing. Two of my great loves in one book? Sign me up! If you share one or both of these passions, check this book out. Year of Wonders, by Geraldine Brooks. Brooks is another one of those writers I struggle to wait for paperback versions to come out. Here she tells of a small village during the plague that self-quarantines to protect others. A beautifully told, poignant story from an unlikely heroine in the village. Images from this novel revisit me again and again. The Secret Scripture, by Sebastian Barry. I picked up this book and didn’t think twice about bringing it home. Set in Sligo, Ireland – one of the most beautiful places on this whole entire earth – the story attempts to uncover the truth of the memories of an almost-100-year-old woman living in an insane asylum that’s closing down. The story reveals itself by alternating between a narrative the patient herself writes and hides under the floorboards of her room and notes from her doctor as he tries to learn the truth. A friend also recommended the book to me, the same day I had pulled it out of my unread book pile. As I read, I wondered if that friend really had read the book or really knows what type of books I like (she did and she does). There’s a lot about it that’s dark and stark and painful. But it surprised me by not being predictable (which I suppose is to be expected with such an unreliable narrator), and its engaging storytelling won me over in the end. But why is Jesus so tough on us? He is tough because the incongruity of sinners refusing to forgive sinners boggles God’s mind. … The gift of being forgiven and love’s power to forgive are like yin and yang. Each needs the other to exist. To receive the gift without using the power is absurd; it is like exhaling without inhaling or like walking without moving your legs. It is really a question of style. How do you usually respond to people who hurt you? Do you always go for the jugular? Do you plan revenge every time someone treats you badly? … If you never even want to forgive, never even try to remove a hateful memory and restore a loving relationship, you are in a lot of trouble. Smedes makes it sound so simple and so hard and yet so necessary to forgive those who hurt us. Maybe even those teachers who made us read Wuthering Heights or Crime and Punishment or [fill-in-the-blank-with-your-least-favorite-book]. If you have read or do end up reading one of these books, I hope you’ll comment on it here. And of course, I’d love to hear your recommendations for what I should add to my ever-growing pile of unread books. This entry was posted in flourishing tree and tagged books, forgiveness, literature, michael hyatt, southern writers, Spring by hopesquires. Bookmark the permalink. I would like to say that it sounds like the friend you referenced in this blog has very good taste in meaningful literature:). This sounds like a great list of books and I am impressed you can keep all the story lines and characters straight. I will agree with you that Confident Heart is awesome!! And while I went into The Hunger Games kicking and screaming (I’m reading it now for a book club), I am enjoying it and having a hard time putting it down. The other book on my nightstand right now is Made to Crave by Lysa Terkeurst. A good friend told me I needed to check it out. Now I just need to make more time for all this reading. I guess that’s where Robert Bruce’s post on Michael Hyatt’s blog comes in. You’re the second person who has recommended The Hunger Games to me. Maybe that one should be next (a must-read before I see the “must-see” movie). Let me know how you like Made to Crave. I got so much out of that book, and now Lysa TerKeurst has written a version of the book for teens and young women. Finding more time for reading is hard, I know. I think the first step is simply becoming aware of how we spend our free time, and swapping out some of the mental junk food for more reading. Keep me posted on your journey, Kelly! I also love Geraldine Brooks, and I’d have to say that Kaye Gibbons is one of those few authors whose works I take the time to re-read. I’m a cyclical reader–lots of (easy) fiction during the school year, and heftier non-fiction, including lots of history, when I’m out of school in the summer. So I’m the opposite of everybody else in that my beach reads include things like biographies of Joseph Smith and other non-summery topics. I am going to print out your list as soon as I finish typing this and go to the library’s website to see what is available digitally and in good old-fashioned print. Thanks for the list! So, this reader’s opinions include a caution about Backseat Saints. Joshilyn Jackson is a great writer. But, if you haven’t read any of her books before, I don’t think this is the place to start. A better choice would be gods in Alabama or Between, Georgia. Yes, a great first novel from Leonie Swann — and another book set in western Ireland. Yay! I don’t remember when I’ve enjoyed a book told by sheep quite so well. Thanks for sharing some of your recent favorites, Chris! I aspire to come up with a great opening sentence to a novel like that some day.